The good news is PSLV C23 LAUNCHED SUCCESSFULLY…. Agency reports state that ISRO today launched five satellites from four countries from the spaceport of Sriharikota in presence of Prime Minister Narendra Modi. 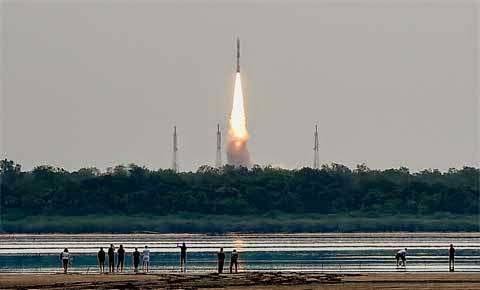 The launch of rocket Polar Satellite Launch Vehicle (PSLV-C23) lifted off from Satish Dhawan Space Centre in Sriharikota at 9.52 am today. The 49-hour countdown for the launch was progressing smoothly and preparations for Mobile Service Tower withdrawal to the parking end were also under progress, ISRO said. Speaking to ANI, former ISRO Chairman Madhvan Nair said, "PSLVC-23 launch will be a major stepping stone towards centering space commerce". The five satellites are from four countries - France, Germany, Canada and Singapore. According to news reports, PSLV C23 lifted off from the spaceport at 9.52 am on Monday instead of 9.49am as decided when the launch plan was announced. One of the debris objects could have come as near as 40 metres from the spacecraft and by delaying the launch Isro wanted to avoid the objects by thousands of kilometres as debris move at a velocity of several kilometres per second, said Isro officials. A report quoting experts stated that the debris from the 2011 collision of a US satellite and a Russian satellite, were found at altitudes above 600km. This means that the PSLV rocket was not in danger during the flight, but the satellites, during or after their injection into the orbit, could have been at risk. It may be noted that until PSLV-C23, the largest number of satellites from other countries launched by PSLV were from Germany. The other countries which had sent their satellites through PSLV include UK, Denmark, Austria, France, Singapore, Switzerland, Israel, Italy, Belgium, Republic of Korea, Indonesia, Argentina, The Netherlands, Algeria and Luxembourg. Proud to be an Indian - S. Sampathkumar. Source : Zee News, NDTV; Dinamalar; Business Standard & ISRO. Here is something more after the success ….. Prime Minister Narendra Modi said today that India’s space programme must be made available to developing nations, and the SAARC countries in particular, minutes after witnessing the successful launch of five foreign satellites on board the Indian Space Research Organisation’s (ISRO) workhorse PSLV rocket. Spelling out his vision for the Indian space sector at ISRO’s first commercial satellite launch in over a year, and the first since the BJP government came to power, Modi said, “India is rooted in the age old ethos of Vasudhaiva Kutumbakam — the whole world is one family. India’s space programme is driven by the vision of service to humankind and not by the desire for power. We must therefore share the fruits of our technological advancement with those who do not have the expertise, and our neighbours in particular.” He said, “Today I ask our space community to make plans for developing a SAARC satellite, a satellite that provides a full range of applications and services to all our neighbours. There is a lot of poverty in the SAARC nations and we need scientific solutions for this. It will be beneficial for the development of all the countries in the region.” Great words indeed !! !.